To commemorate our 70th Anniversary, we invited past and current CCMH/WCCMT students to participate in a survey designed to find out about their learning experience and what they’ve been up to since or plan to do after graduation. There’s never been a better time to study Massage Therapy. CCMH/WCCMT has offered outstanding Massage Therapy education since 1946 to students of all ages, skills and educational backgrounds. 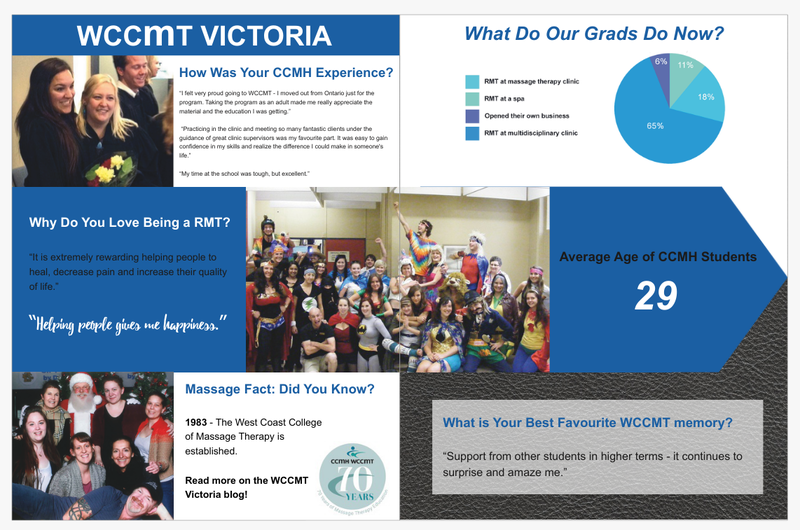 If you are interested in a career path as a Massage Therapist or learning more about WCCMT, follow us on Facebook. If you’d like an opportunity to visit our campus, email us at [email protected].